WSU’s submarine, named Cobalt, was sponsored by the Naval Sea Systems Command. PULLMAN, Wash. – Imagine a robot moving around a casino, gambling at the tables by itself. Now imagine the casino is 16 feet under water. 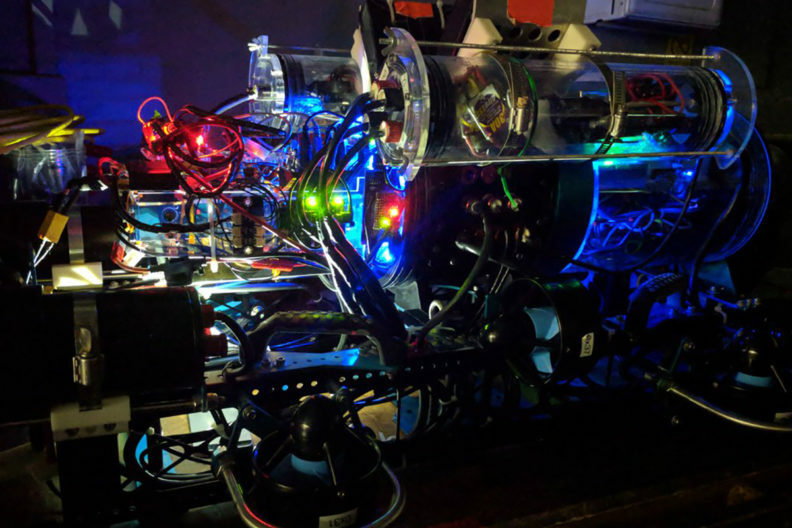 Students from Washington State University have built such a robot submarine to compete in the 21st Annual International RoboSub Competition being held July 30-Aug. 5 in San Diego. The competition is aimed at boosting the research and development of autonomous underwater vehicles. Hundreds of high school and college students from around the world are participating in this year’s event. The competition’s theme this year is based on games of chance found in a casino. Competing submarines will have to perform tasks in an underwater casino with roulette tables and slot machines. Ten students from WSU’s Palouse RoboSub Club are bringing their robot submarine to compete in the pools at the U.S. Navy Space and Naval Warfare System Center Pacific’s TRANSDEC facility. The Palouse RoboSub Club was formed to provide students with an opportunity to do real-world engineering in the cutting edge areas of robotics and artificial intelligence. 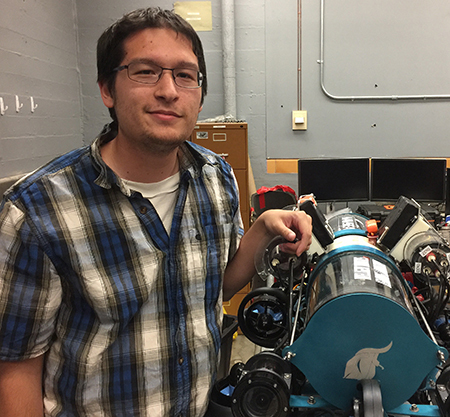 To improve upon last year’s performance, the WSU team has improved the stability of the submarine, revamped the artificial intelligence that powers it and improved the artificial vision system to see better underwater. For the first time ever the team has also installed hydrophones, which are sensors to help orient the submarine underwater. 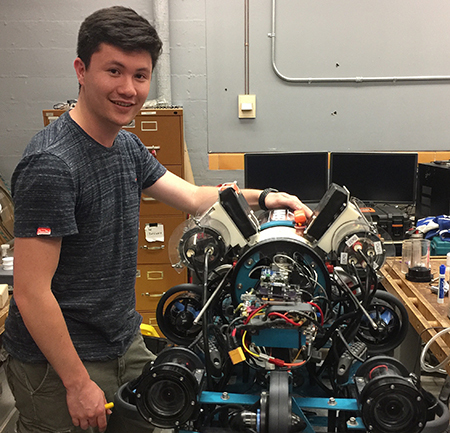 Daylan Kelting, WSU computer science student, working on robotic sub. Palouse Robosub Club president and WSU computer science major Daylan Kelting is aiming for a high finish at this year’s event. “If we can get the hydrophones working well, we are confident we can finish in the top eight,” said Kelting. The theme of this year’s competition also prompted the team to install a device to drop balls on to a spinning roulette table many feet underwater. The team tested the robotic submarine in WSU’s Gibb Pool. Students gained valuable technical skills working on the submarine, including programming, electric circuit board design and workflow management. They had to learn many skills on the fly, like figuring out how to design and create their own circuit boards. “We determined what the board needs to do, designed it on a computer and then soldered all the components by ourselves,” said team member Zach Pratt, a junior majoring in electrical engineering. Alexander Lanphere examines inner workings of robotic submarine, Cobalt. Besides technical skills, working on the submarine helped develop teamwork and collaboration skills, said Alexander Lanphere, a mechanical engineering major who worked on the sub’s ball dropper and thruster guards. “A lot of skills we learn here are useful to know for jobs in industry,” said Kelting. “I’m hoping to meet recruiters from companies like SpaceX and Blue Origin at the event,” said Lanphere. The development of WSU’s submarine, named Cobalt, was sponsored by the Naval Sea Systems Command. The competition this year runs July 30-Aug. 5 in San Diego. A livestream of the final segment of the competition can be viewed 1-5 p.m. Sunday, Aug. 5, on the RoboNation website.